The esteem in which the late William Thomas McQuade was held by the people of Harvey and surrounding districts was evident on Friday last when between 200 and 300 mourners attended his funeral at the Church of England portion of the Harvey cemetery. The cortege of 94 cars was one of the largest seen in Harvey. The late Mr. McQuade, who died as the result of a railway accident at Harvey on May 26, was born at Northam in 1895, spent his early childhood at Mokine, and the remainder of his life at Cookernup and Harvey, with the exception of his war service. Married on September 20, 1915, the late Mr. McQuade left within a week or two with the old 51st, on overseas service in World War I. He received the Military Medal from the hands of Prince Edward, (then Prince of Wales). Always a staunch supporter of the Labour movement, “Bill,” as he was affectionately known to all, was ever ready for a friendly argument on politics with anybody who would discuss the subject. These included Sir Ross McLarty and the late Sir James Mitchell, with whom he was excellent friends. Once, having a tête-a-tête with the late Sir James, during a visit to Harvey, old timers tell of Sir James saying “You’re not a bad chap, Mac, but you don’t think straight”, (referring to his political beliefs). Football and cricket were amongst Mr. McQuade’s many interests, he having played “A” grade for Harvey in both these sports years ago. Possibly his main interest was first aid, his knowledge of which he was ever ready to impart. He had been of great assistance in this respect to the Harvey Football Club, and to the doctors in years gone by when post mortems examinations were carried out in one of the garages of the hotel in Harvey. The deceased was one of the prime movers in starting what is now the Harvey District. Hospital. His cheerfulness and ever helping hand will always be remembered. Mr. McQuade leaves a widow and two sons, Will and Frank, who flew over from South Australia to attend the funeral, and an only daughter, Mrs. W. Johnston, of Harvey. Among the many mourners at the graveside were Messrs. Hearne, of Perth, who represented the Commissioner of Railways, Mr. L. Whatman, Traffic Manager of the W.A.G.R. at Bunbury, and representatives of the various organisations, R.S.L. and lodges of which the deceased was an honoured and respected member. Amongst the many messages of condolence received by Mrs. McQuade was one which shows more than ever the high esteem and affection in which her late husband was regarded. The Commissioner of Railways, in which department the deceased had served faithfully since 1918, notified Mrs. McQuade that as her late husband had been due for retirement early next year, and in appreciation of 42 years’ unremitting service in the department he had been honoured under the tragic circumstances, to award the late Mr. McQuade the Gold Medal for long and faithful service to the department. This would be forwarded to Mrs. McQuade after it had been suitably inscribed. The Rev. B. P. Wrightson officiated at the graveside and the pallbearers were Messrs, E. Davis, A. Gear, W. Martin, E. Smyth, G. Rigg, R. Hester, F. Byrd and W. Johnston [sic Johnson]. 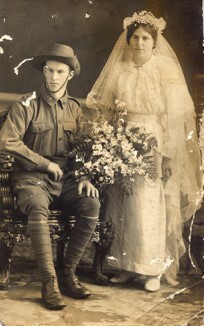 Bill McQuade and Connie Dalton on their Wedding Day, 1915. Photo courtesy of Kerry Davis. © 2019 Harvey History Online | WordPress Theme: Cosimo by CrestaProject.